PRO-LINE BASH ARMOR BODY WINNER! « Big Squid RC – RC Car and Truck News, Reviews, Videos, and More! 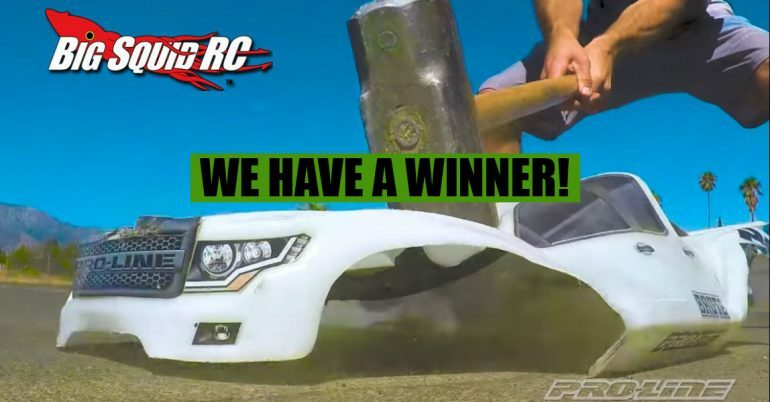 We have a winner in our Pro-Line Racing Bash Armor Giveaway! Congratulations to Steven W. from Garland TX on winning the awesome new Bash Armor body for the Traxxas X-MAXX! Hopefully you have an X-MAXX to throw this thing on because we are going to want pictures! We will be contacting you via email, and you will have 72 hours to respond back. If we do not hear from you, we will draw another name. Everyone is now hoping he does not answer.. lol. Special super thanks to Pro-Line Racing for helping us make this contest happen! Didn’t win this one? Keep your eyes open for another coming very soon!